A LANDSLIDE TRIGGERED by torrential downpours has killed at least eight people and left 100 missing on Indonesia’s main island of Java, an official said today. TV footage showed mud covering hillsides and across roads, damaged houses, and bystanders watching the rescue effort. It also showed rescuers placing an orange body bag in the back of a pickup truck. “At the moment eight people have been found dead and we are still looking for 100 unaccounted for,” agency spokesman Sutopo Purwo Nugroho said, adding it was unclear whether those missing were buried under the landslide or had taken refuge. He said there was no phone signal in the area, which made coordinating rescuing efforts difficult. A second agency official, who declined to give his name, said that 200 rescuers and 500 volunteers had joined the search for the missing. 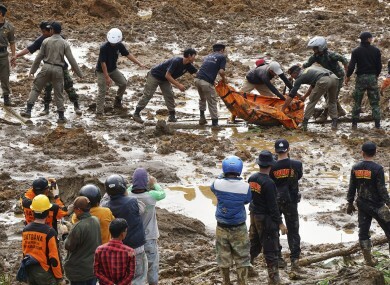 Email “Rescuers dig through mud after Indonesian landslide kills 8 people”. Feedback on “Rescuers dig through mud after Indonesian landslide kills 8 people”.